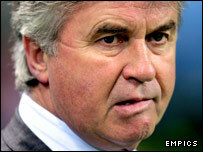 Guus Hiddink's agent says the Dutchman is "totally out of the reckoning" to become the new England manager. Cees van Nieuwenhuizen says the Football Association has not followed up an initial approach to the PSV Eindhoven and Australia coach. "He definitely won't be the England manager," van Nieuwenhuizen told BBC Radio Five Live's Sportsweek programme. "In spite of all the rumours he has not been in England and the FA has not been to Holland for a serious interview." Hiddink will leave PSV at the end of the season and Football Federation Australia say they do not expect him to continue as coach after the World Cup. He had been tipped to succeed current England boss Sven-Goran Eriksson, who will stand down after this summer's World Cup finals, but Hiddiink has also been linked with the Russian national team. Van Nieuwenhuizen revealed he was unhappy with the manner of the FA's approach. "There has been some contact with me but the way it was done was, for us at least, not so serious," added van Nieuwenhuizen. "They were interested in having a coffee or tea and finding out if he could be a potential candidate to be put on the shortlist. "We did not take it too seriously because you expect that if you are in the world of football then you know who Guus Hiddink is and what he has achieved on a club level and on a national level. "I think either you go for him or you don't go for him, not sit down to find out if he might be good enough to have his name put on a list of candidates. "He is totally out of the reckoning. That doesn't disappoint him at all. "If people have to find out if he could be a candidate to be put on a shortlist then I think this is sort of an insult to Guus and his achievements so far." However, FA director of communications Adrian Bevington would not be drawn on the claims from Hiddink's agent. He stated: "The FA's position is we don't discuss any individuals who may or may not have been approached for the England job." Former Celtic manager Martin O'Neill is another whose name has been widely linked with the vacancy. Hoops captain Neil Lennon has worked with O'Neill at Leicester and at Parkhead, and said he was not surprised by the connection. "It doesn't surprise me, I think he's the best choice - I think he's the best manager ever," he told Radio Five Live. "When we were at Leicester, every time a job came up his name was the first on everyone's lips. It's just because he's a good manager. "I worked with him for nine years and loved every mintue of it, he's an inspirational kind of figure." Who is going to get Sven's job?